"It seems like they've built essentially a side-friction roller coaster," an expert said. The wooden Leap-the-Dips amusement park ride in Altoona, Pennsylvania, is the oldest roller coaster still running in the United States. Built in 1902, it became a National Historic Landmark in 1996. It's known as a side-friction roller coaster, a type so outmoded that only a handful of vintage amusement parks worldwide still have one. The key to the ride is a set of wheels that roll and bounce against a vertical plane to keep the cars on their track. 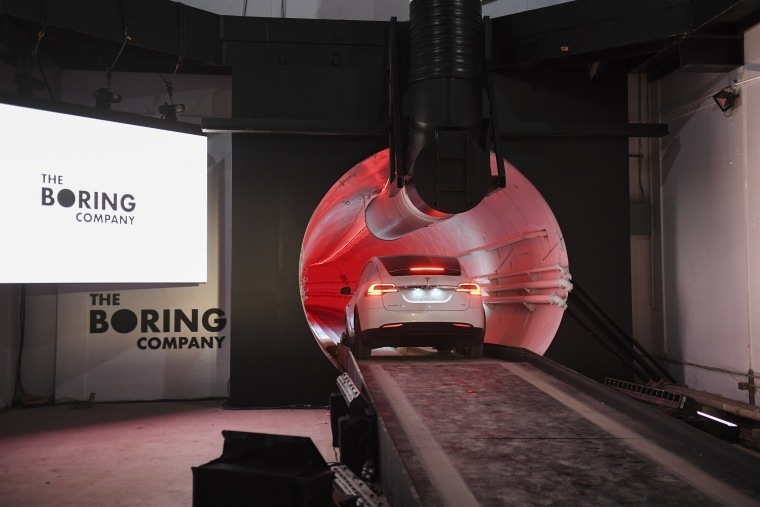 Some roller coaster fans were surprised to see the same set-up used in the futuristic Loop test tunnel unveiled Dec. 18 by Boring Company founder Elon Musk. In the roller coaster world, at least, the tech has been supplemented for nearly a century by up-stop or under-friction wheels, which ride beneath the track parallel to the main wheels as a fail safe. "It seems like they've built essentially a side-friction roller coaster, minus the coasting part," said Nick Weisenberger, an automotive engineer who co-manages Coaster101, a roller coaster news and appreciation site. "That's old-school." Indeed, Leap-the-Dips reaches a top operating speed of only 10 mph; there's nothing keeping it from bouncing out of its tracks at higher speeds. Musk has promised his Loop would take electric Tesla vehicles at speeds of up to 150 mph, a rate reached only in the last decade of roller coaster development by Ferrari's Formula Rossa ride in Abu Dhabi. That attraction features side-friction wheels, but it also uses up-stop wheels and regular track wheels, a fairly standard configuration today. The side-friction wheels help the ride maintain speed and lateral stability, experts say, but the up-stop wheels keep it from flying off the track at such high speeds. "You don’t see side-friction roller coasters built anymore," Weisenberger said. "You're not really securing the vehicle to the track." A spokesman for the Boring Company did not want to comment using his name. Pete Trabucco, author of "America's Top Roller Coasters and Amusement Parks," said old side-friction rides emphasize lateral motion as part of the experience. But, he said, this wouldn't be ideal for transportation. "Side-friction makes it feel like you’re actually going to fall off the track," he said. "The side motion stuff actually gets people sick." Musk's brainchild appears to have had a last-minute evolution from using futuristic "skates" to carry 16 passengers to using Model X SUVs (priced at $84,000 and higher) from his automaker, Tesla. Those can carry as many as seven people. "The capacity on the Loop seems like it would be very low compared to a large transit solution," said mechanical engineer and roller coaster aficionado Eric Wooley. Musk indicated the tunnel system he wants to build under Los Angeles would accommodate autonomous electric cars from various makers. And he hopes to take 4,000 passengers an hour up and down the city's congested Westside. The billionaire, who has touted his tunnel development for nearly two years as a solution to L.A.'s "soul-crushing" traffic, said the demonstration in Hawthorne, California, was just a loose test of technology that's rapidly evolving. And, to be fair, whatever his Loop is, it's not a roller coaster. Yet the small diameter of the test tunnel could limit the kinds of vehicles that would fit. Musk said a 14-foot diameter, half that of a standard subway tunnel, allows for faster construction. But it might take many of them to move thousands of people at one time. "They could do something where the track, the rails, were wide enough for different cars," Wooley said. "But the tunnel looks narrow. Obviously, you couldn’t fit a much wider or taller vehicle in there." Musk admitted that VIPs and journalists who took the first trips in the 1-mile tunnel were in for "a slightly bumpy ride." And speeds were limited to about 45 mph. An elevator was used to lower the vehicles into the tunnel, about 40 feet below ground. The display had some people in the amusement ride world scratching their heads. Roller coasters often use gravity to get up to speed in key sections, and 40 feet would be a nice start. But Boring Company has forfeited this free momentum in favor of elevators. And the bumpy ride indicates the Loop could have stability problems at higher speeds — which is why up-stop wheels became a norm, at least for roller coasters, since their invention in 1919. Roller coasters, trains and subways also use lower friction wheels made of metals or urethane, which produce higher speeds. Concrete rails, which Boring appeared to use, would also increase resistance. Musk suggested that the side-friction wheels used on the test car could be purchased for $300, but vehicles using a 150 mph surface would likely also need speed-rated performance tires that often cost 50 percent more than regular all-season rubber. It all has some observers wondering if this is just a private route for the rich. "From the energy and efficiency side of looking at it," Wooley said, "I’m not sure I’d choose that over building a subway."